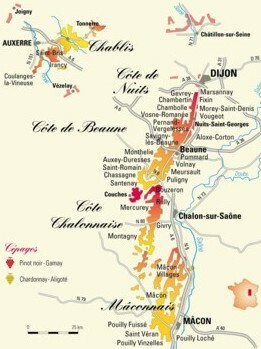 The vineyards of Burgundy form a rich and complex whole. Three ‘departments’ from north to south: Yonne (capital Auxerre), the Côte-d'Or (Dijon) and Saône-et-Loire (Mâcon). A 2nd Century low-relief discovered in Escolives-Sainte-Camille confirms the presence of vines in the region, but the expansion of Burgundy’s vineyards can really be traced back to the abbeys of Cîteaux and Cluny.